ITV joined forces with children’s charity ‘Save the Children’ and created a six-week series to raise much for the excellent cause. Inspired by Save the Children’s “No Child Born To Die” slogan, Born To Shine was introduced and saw talented children mentor celebrities in a new skill in the weekly Sunday night series. The series was designed to raise money via voting revenue, fundraise and through view donations following inspiration films which were presented by Save the Children supporters which highlighted the charity’s work in India, Liberia, Kenya, Sierra Leone, South Africa and the UK. For the event, ITV and Save the Children contacted us to create custom printed T-Shirts which featured both the ‘Born To Shine’ and ‘Save the Children’ logos on the T-Shirt. The Save the Children logo had to match the charities colours perfect so we decided that screen printing was the perfect printing technique to print the logo on the back of the T-Shirts. At Garment Printing, we’re proud of the work that we do for charities and this is reflected in our exclusive charity discount which gives all charities 20% off their orders. To help raise money for this worthwhile cause we also sponsored the event and provided the T-Shirts at an exclusive discount for the occasion as well. 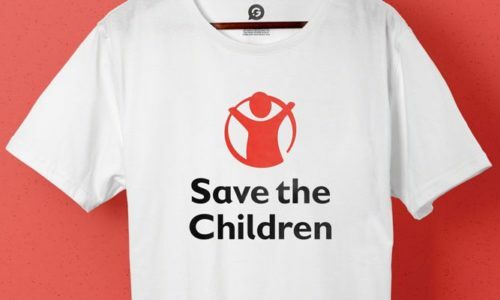 The T-Shirts were all printed using the above-mentioned printing techniques and both Save the Children and ITV were delighted with the final printed product. To showcase the work that we had done to help raise money and the excellent charity printing that we was able to provide, ITV also gave us a special mention on their Born to Shine page on the ITV website.